IF THE RUNNER IS PUT BETWEEN THE ROWS OF CHAIRS.... IT WILL TAKE ABOUT 9-10 ROWS OF CHAIRS ON EACH SIDE OF THE RUNNER..... DEPENDING ON HOW FAR APART THEY ARE PER ROW. CAN BE USED INSIDE OR ON DECKS. IF USED OUTSIDE ON GRASS IT MUST HAVE PLASTIC UNDER IT AND IT MAY BE SLICK AFTER THAT. 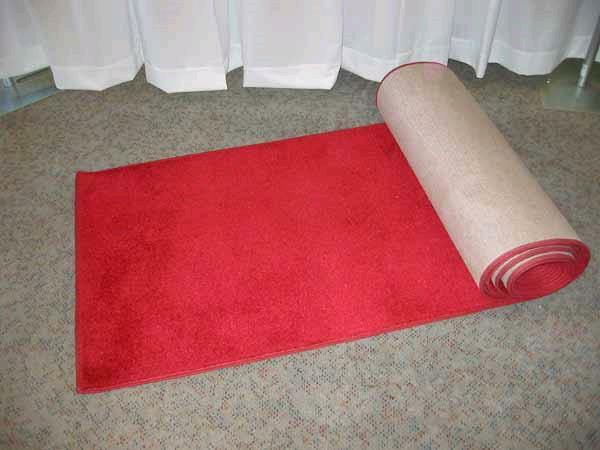 * Please call us for any questions on our aisle runner 25 foot red rentals in St. Helens OR, Scappoose and the South Columbia County area.